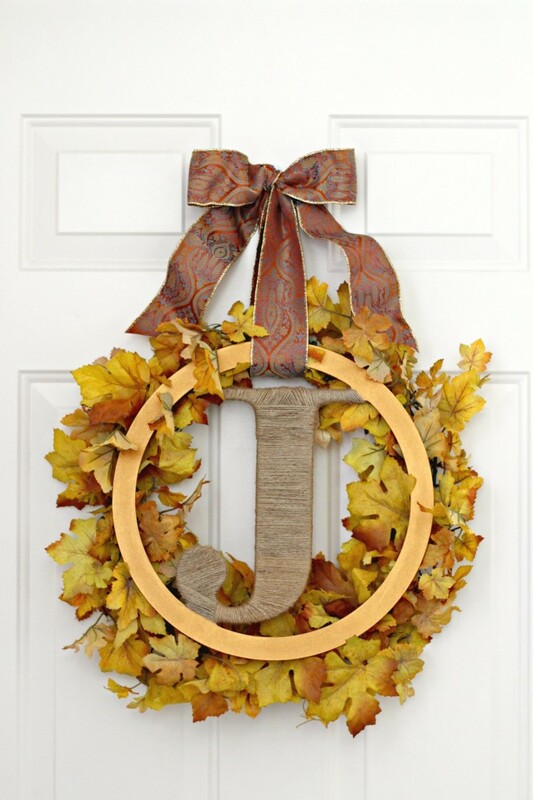 Beautiful Leaf and Monogram Fall Wreath to welcome guests to your home. I couldn’t wait to start creating for Fall. I won’t be decorating until the middle of September but I can’t wait to pull out the warm colors, cozy textures, pumpkins, and leaves when it’s time. I needed wanted a new wreath for the front door so I decided the monogram that’s been laying around since last Winter was finally going to be used. There’s just something refreshing and welcoming about crisp leaves and a pretty monogram on the door. 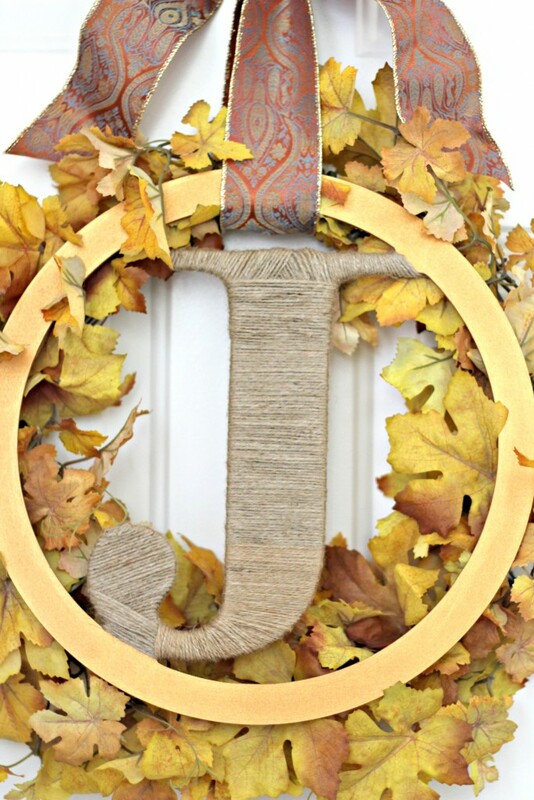 I hope this Monogram Fall Wreath welcomes lots of visitors this Fall season. 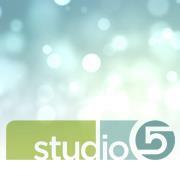 Affiliate links are supplied for your convenience. 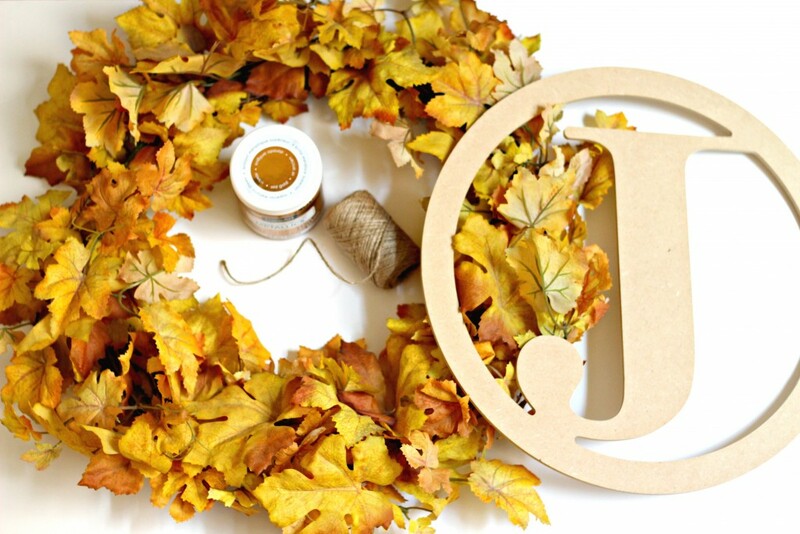 You can purchase a leaf wreath or make your own using a twig wreath and artificial leaves. I made this one several years ago and it’s held up pretty well. You can use a leaf garland or bunches of leaves and hot glue them to the twig wreath until you have the fullness you like. 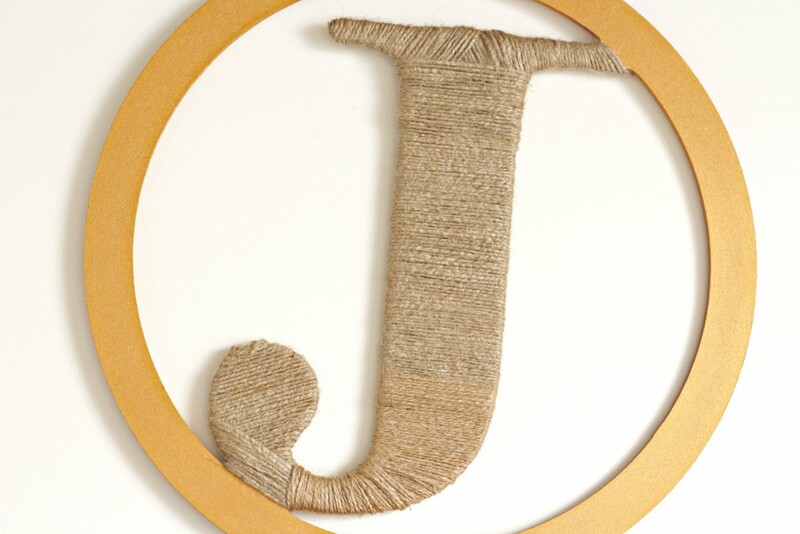 It really isn’t necessary to paint the whole monogram since the initial will be covered with jute, but I wanted it to be painted on the chance you could see between some of the jute. I gave the part of the monogram that was going to be showing 2 coats of paint and the letter area one coat. 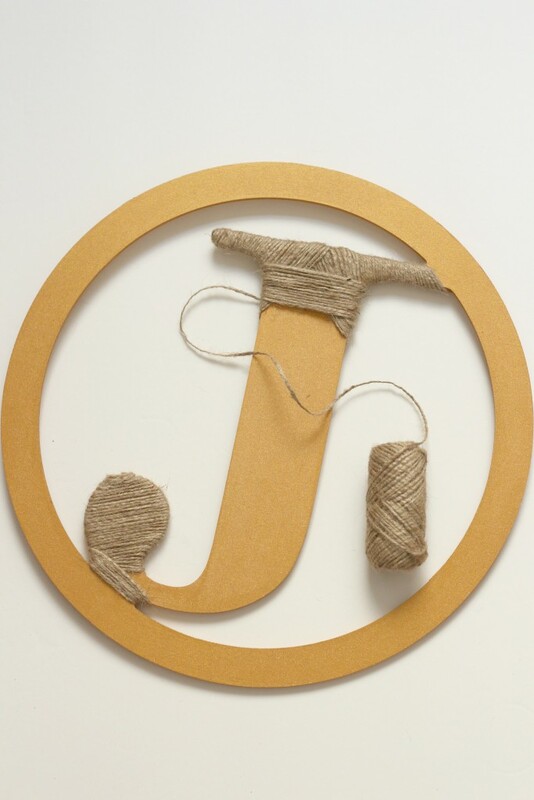 Let it dry completely before wrapping the jute around the letter. 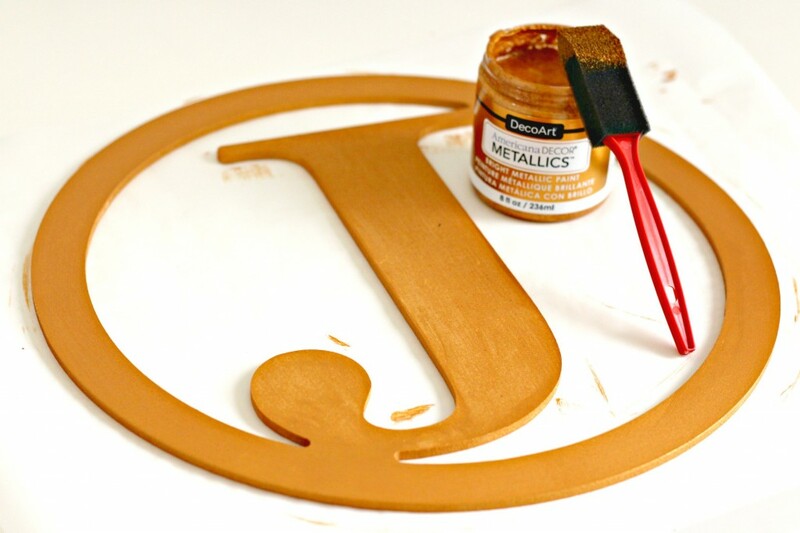 Metallic paint takes a little longer to dry so take that into consideration if you’re in a hurry. All letters are shaped differently so plan out how you want to wrap your letter before you start wrapping. I had decided to wrap the top and bottom of the J first then have the center overlap the ends. 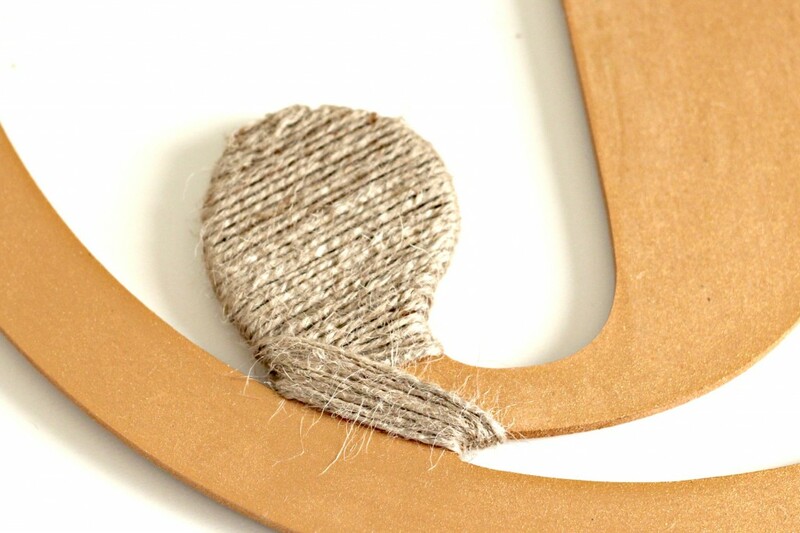 Hot glue the jute to the back of the monogram. 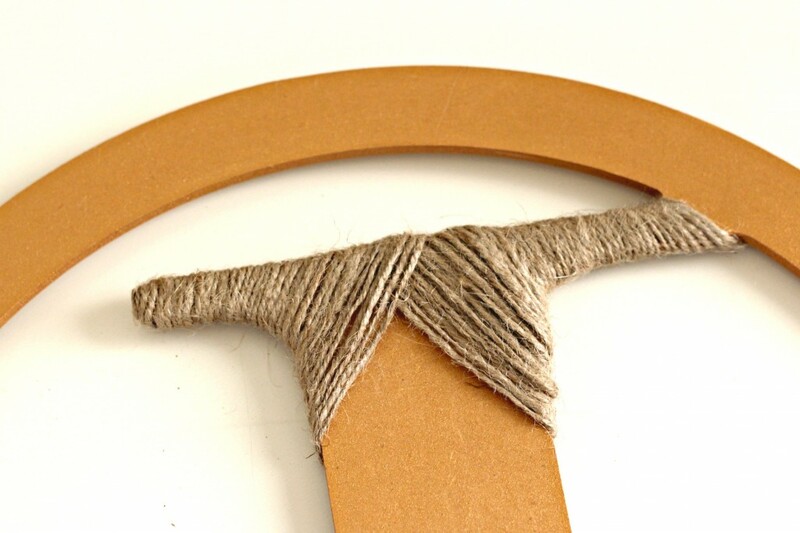 You will need to secure the jute in several places, especially on curved areas. Always glue on the back or side of the monogram so it doesn’t show on the front. Since the center of the J is straight I only had to secure it with glue every 10-15 wraps. 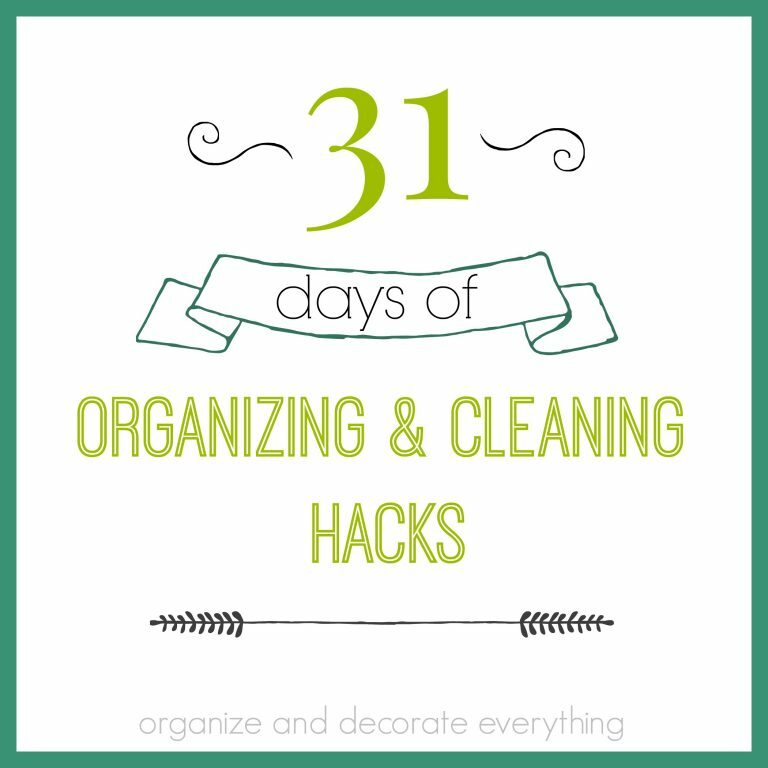 Wrapping takes a while so put on your favorite movie while you do this part. 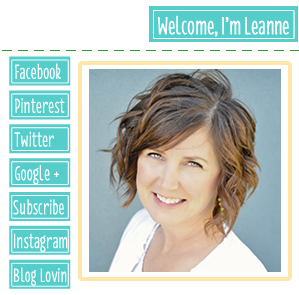 I had this ribbon in my stash and it was perfect for this project. 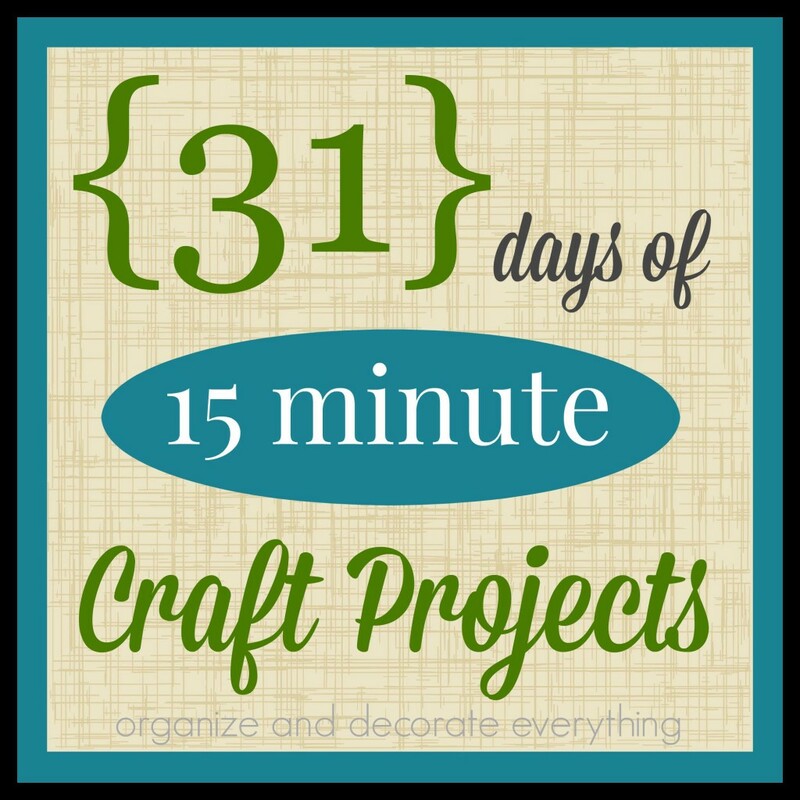 I love the colors and design, perfect for a Fall wreath. I laid the monogram on top of the wreath and joined them with the ribbon. Since they’re not permanently together I can take them apart and use them separately later if I decide to change things up. I tied the ribbon in a bow to hang the wreath. 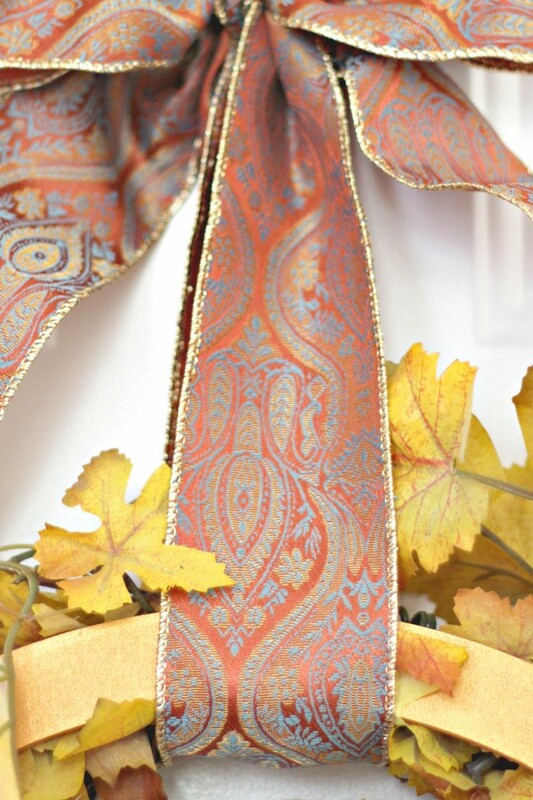 I need to find other uses for this beautiful ribbon, I kinda love it! You can’t really see the metallic paint in the photos but it looks great in person. 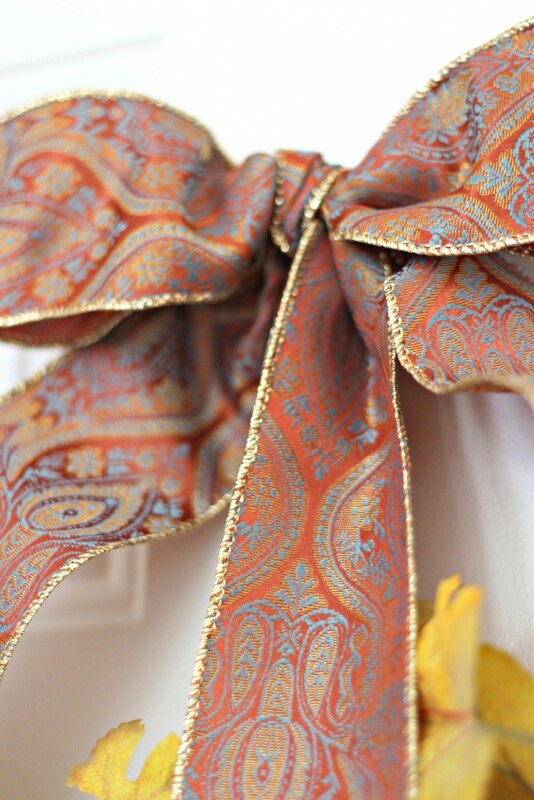 I love the different textures of the metallic, jute, leaves, and ribbon together. Now to just hold off decorating for Fall for another month. What’s your favorite Fall color? I think I’m going with gold this year. That ribbon is lovely – gold is pretty classic. 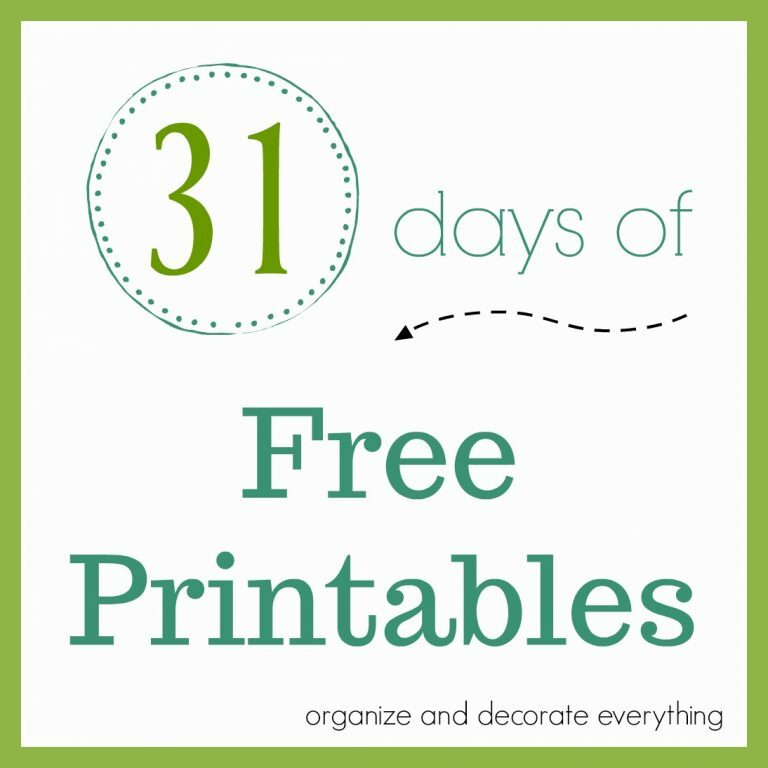 I will probably stay away from the oranges and reds this year and stick to golds and whites and browns – maybe a touch of blue. So pretty!